this is very bad to me i was withdrawn my bcn coin on poloniex but i can't find it and i did not find transaction on your blockchain. pls solve this problem. Why is my transaction not showing on your block explorer??? that's what I was told by the developers! you need to wait guys! Of course you will not lose your coins, just be patient as the system comes back online and all the issues are fixed. whats driving the price today? Bytecoin experiencing so many issues (network stuck, unvalidated transaction) - Bxxxxxe has successfully solved them all!!! Check out how a different Cxxxxxxe based coin improved their algorithm and solved issues BCN has now! Get a life and advertise your crap coin somewhere else. It is getting correction when these ongoing issues will be get fixed it will get restored to its genuine floor. No reason behind this rise and it will be really hard to keep maintain the trade volume continuously. Yay for listing on Binance! I put $50 in Bytecoin last summer. Now that $50 is $900! SUgoi! i try to download wallet version 2.0.4 but if i click still download the version 2.0.2 , why ? update , ok i download it , i cliccked on 64bit version , but i cannot open because say that an old version exist on the system , if i delet old version , i will loose my BCN ? 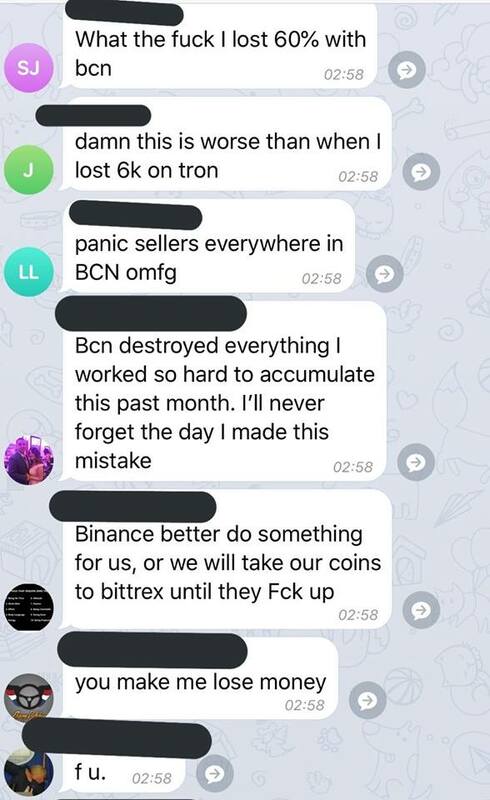 Why u bought BCN on this price level? On the other exchanges the price was 10 times lower. I trade for a few years and I just bought a bit of BCN for 100 satoshi. You were fooled. Now you have to wait, the price should return to 1000 satoshi but it will take some time. i delete wallet version 2.0.2 , i've installed v 2.0.4 but nothing change and if i click on wallet version info you still read 2.0.2 , why ? The ones who panic sold are lost but those who are holding should see their investment return after this is all sorted out. I can't stress enough, if your the nervous type subject to knee jerk reactions and making decisions without thinking them through; STAY AWAY FROM CRYPTO and all other "investments" for that matter. Seriously you people. WTF are you thinking? Just buy your typical garbagecoin when it is low not when it is pumped ffs.